An important measure when analysing camera trap data is the trapping effort of each camera trap and the total for a study. This is typically measured in number of trap nights, usually defined as a continuous 24-hour period when a camera trap is set to be active. The information can then be used for other analysis, such as mark-recapture to estimate population size. As my camera traps are in the field for long periods of time, I like to be able to visualise the camera trap data graphically to track patterns more easily. To do this, I create a master map to visualise how long each trap is active and on which days leopard cats were recorded at each site. This is done with Microsoft Excel to plot dates and shade cells with colour codes when traps were active and when leopard cats were recorded. This also allows me to summarise camera trap effort. However, being poor in math, calculation of camera trap effort is a real challenge. Imagine the pain of calculating camera trap effort for a time period between 5 Oct 2012 4:42pm to 2 Dec 2012 1:10am! For this, I am glad there are tools which other camera trap practitioners may also find useful. 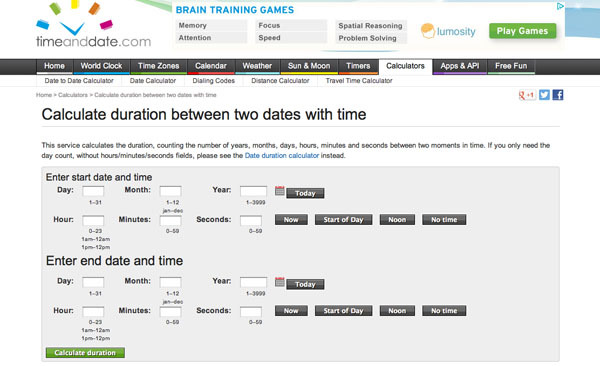 Timeanddate.com has a web-based time duration calculator that allows the user to enter start and end date and time. Saves time. 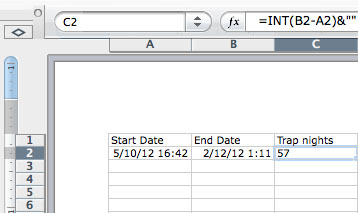 Where depending on format, A2 is the start date and time [e.g., dd/mm/yyyy hh:mm] and B2 is the end date and time. My poor brain is thankful for all these things. The best online Significant Figures Calculator website easy to simple and fast calculator sig fig calculator online easy to simple and good fast quality the best Significant Figures Calculator visit website and enjoy online calculator.